There are memories that you have permanently etched on your brain that will always give you goosebumps when you think of them. Of course it goes without saying there’s those once in a lifetime ones, like the day your babies are born, or when they first tell you I love you, or their first day of school. But then there are the other memories, those hundreds of moments, both big and small, that help shape us. We collect them along the way, on our journey of parenting. 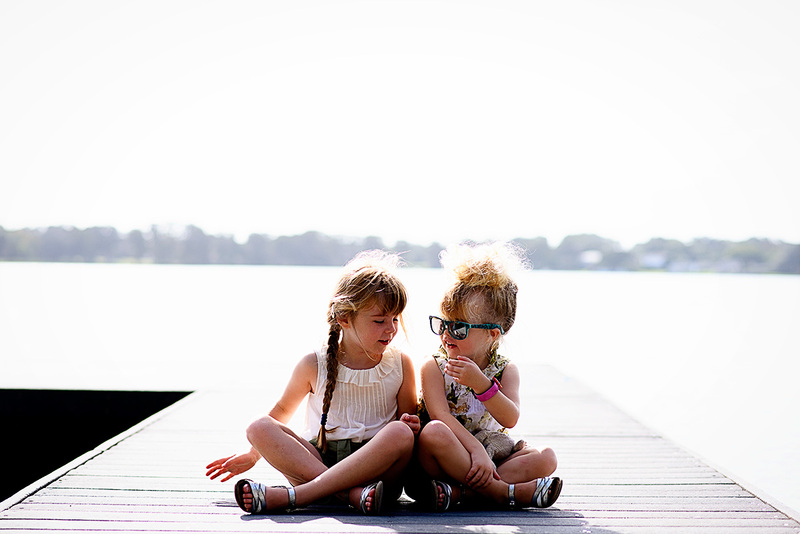 There are the not so good ones, the every day ones, the most ordinary of ones, the tough ones, and the ones that make us smile or laugh whenever we reminisce about them. Then there are those moments that are just magic. 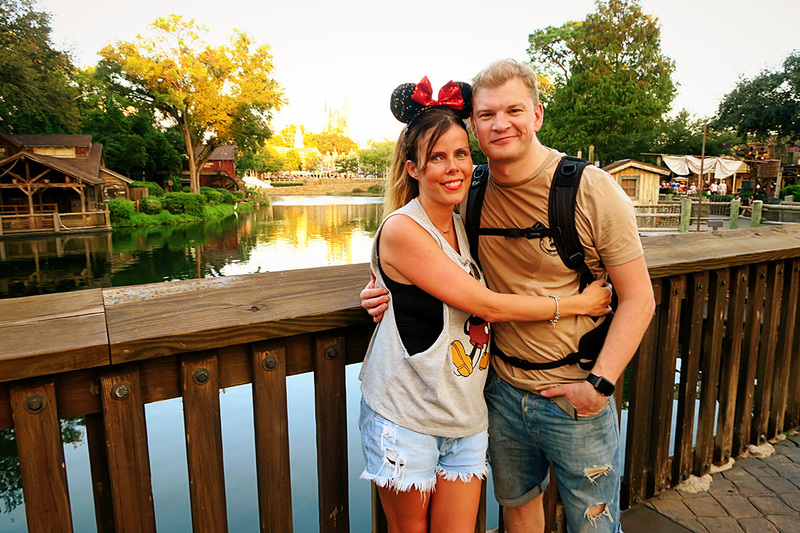 It’s only been a week and a half since we returned home from our holiday to Orlando but already I know that the memories we made there will be those ones that will always make me feel a little emotional when I think about them. 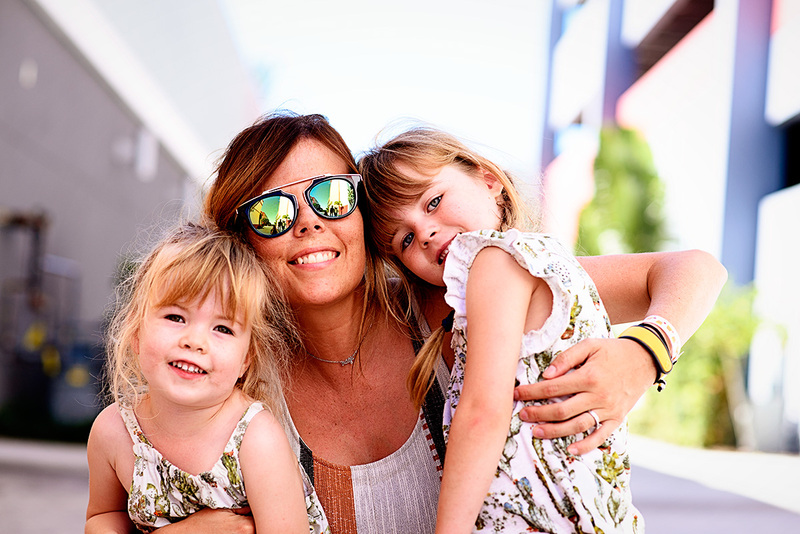 We are so incredibly lucky to travel quite a lot, that we both have a desire to travel with our children, and it is a passion that I love that we share with each other. Each place we go to defines us and shapes us as a family, while also helping connect us to those we love. It is rare that I actually cry when I leave a place behind- and that is what I did when we left Orlando. I walked out of our hotel room, shut the door for the last time and I had tears in my eyes. Mostly of happiness because it was the most incredible experience. But also slightly of sadness because I just didn’t want it to be over. It was one of those holidays that you will all still talk about when your children are fully grown. I will always remember what it felt like to be there. But I guess like with all good stories I should probably start at the beginning. When Visit Orlando got in touch with us to say that they thought we could have a fantastic partnership together, I was absolutely over the moon. We literally counted down the days till our trip, with two little girls so unbelievably excited to be heading to what quite honestly is the most incredible place for families. We were expecting it to be an amazing trip, but we didn’t expect it to be as amazing as it was. 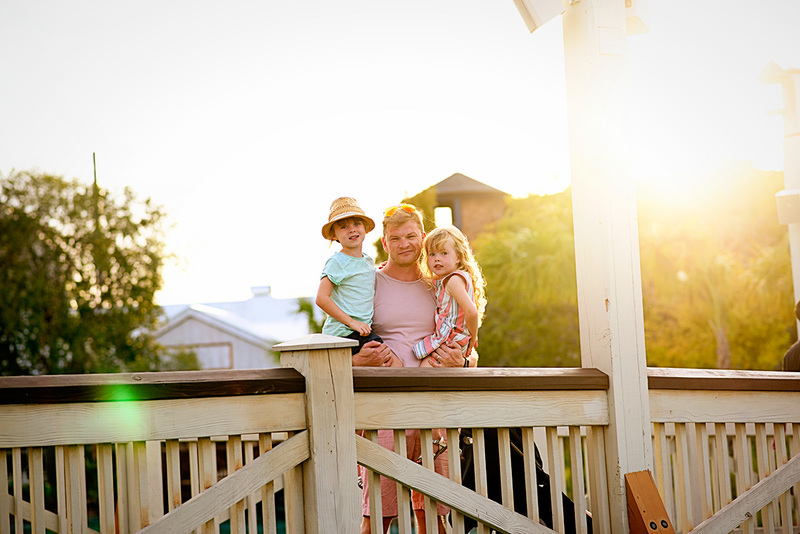 We have all fallen even more in love with Orlando than we ever thought possible and we know that it is going to be a part of our family history going forward. I took so many photos. And lots of video too. While we were there it didn’t feel like I had taken that many, but looking back we managed to pack so much into our week long trip, so as a result I just have so many to share. 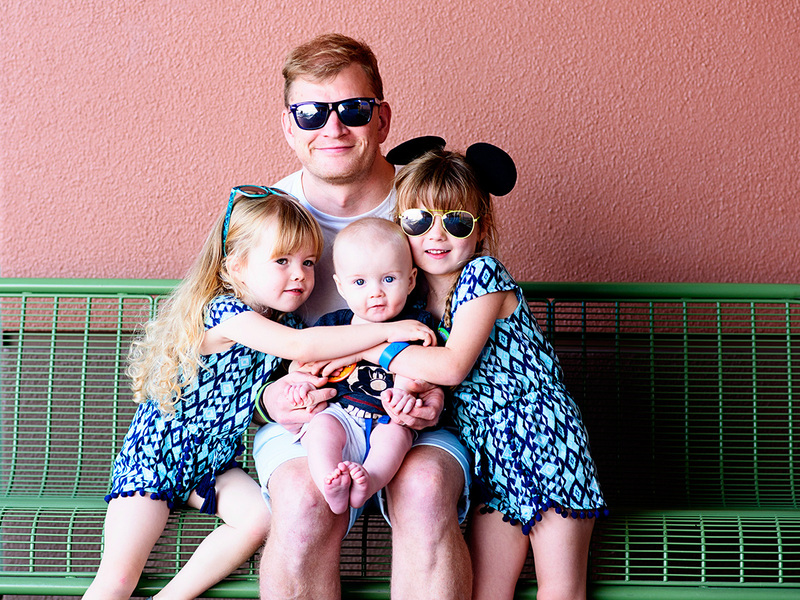 I have loads of things I want to talk about, I want to share tips, informative posts, I want to talk about Disney World and Universal, the other cool things we found to do, plus of course share more photos and a video too. I am going to write them and share them over the next few weeks, so stay tuned for all sorts of posts related to Orlando, but first of all I wanted to share some of my most favourite photos from our trip. On the plane on the way there. 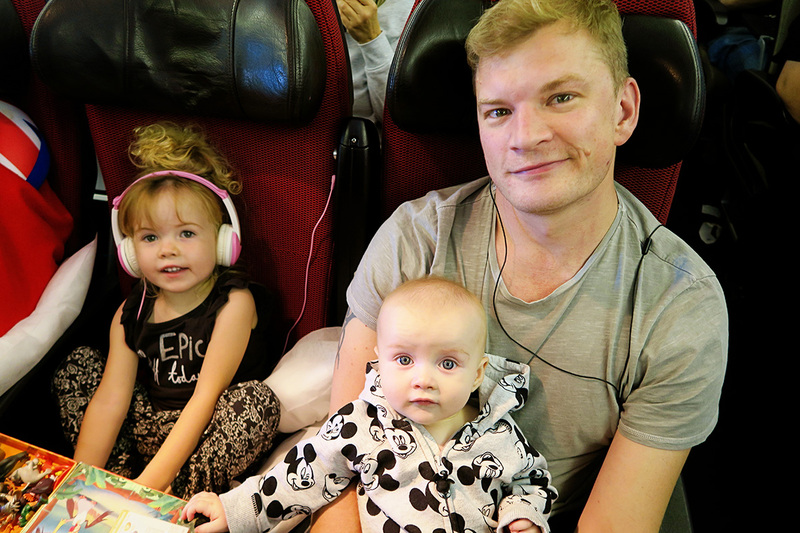 We flew with Virgin Atlantic and the service was excellent, as we were travelling with an infant we managed to get the bulk head seats which was a bonus. I was a little intrigued as to how a nine hour flight with a six month old was going to go but he handled it like an absolute pro. 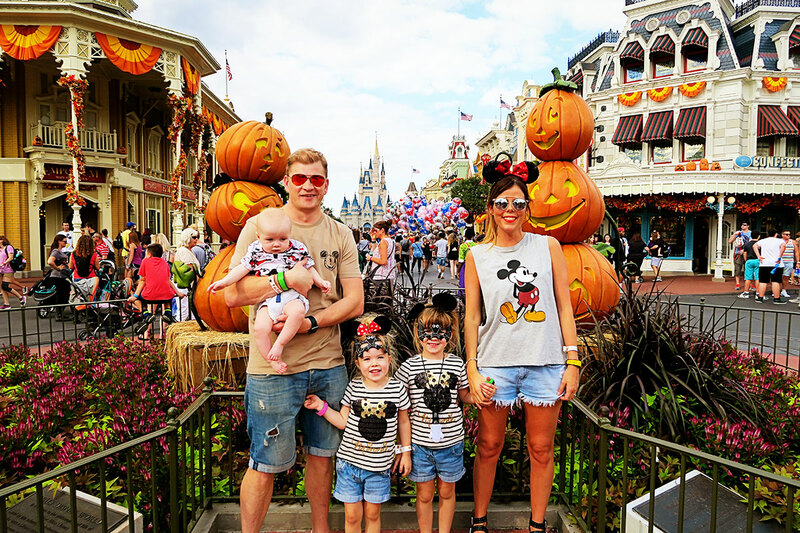 On our first full day we headed to Mickey’s Not So Scary Halloween Party for the afternoon to get our first taste of Disney World. 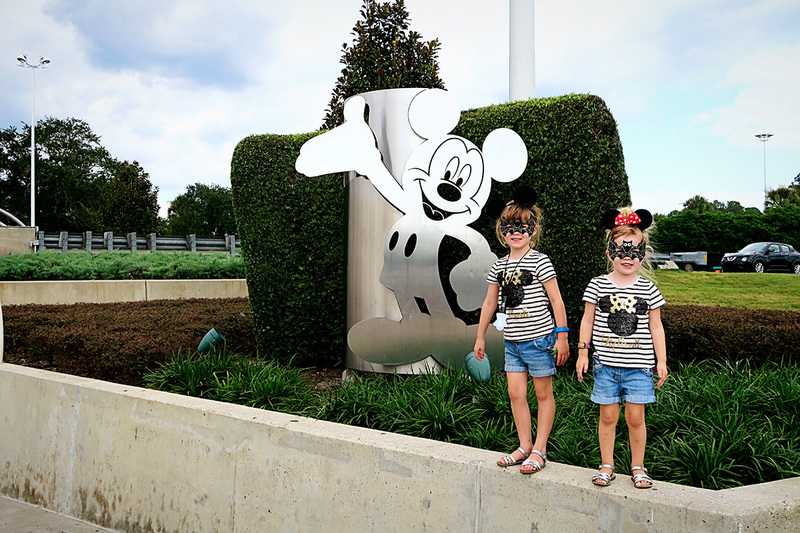 This Mickey sign is at the entrance to Magic Kingdom and the girls were so excited to be there they wanted to get a photo next to it. It reminds me of the excitement of what was to come. I absolutely love this photo. There’s something about entering Magic Kingdom for the first time that gives you goosebumps. I am not ashamed to say that I got tears in my eyes seeing the castle and we had to stop for a photo at the entrance. At Halloween the park is alive with colour and it is just beautiful. We are all in Mickey gear, even our baby boy has a Mickey shirt on. 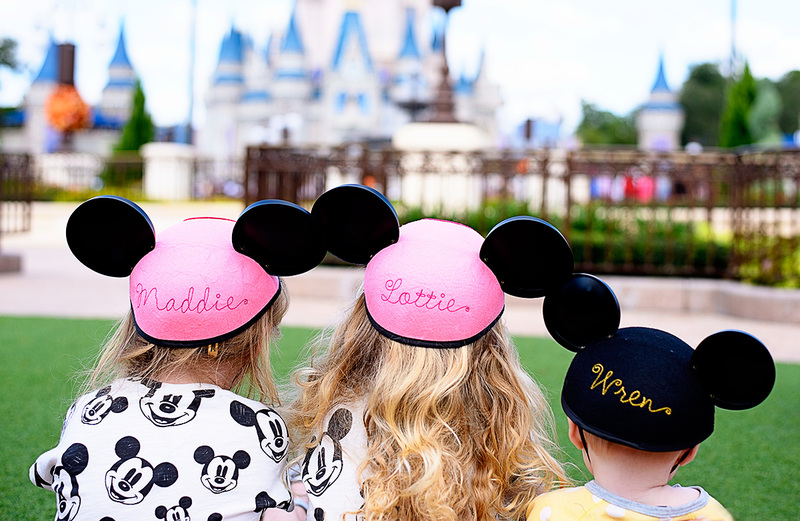 You can’t help but be swept away and fully immerse yourself in the world of Disney, in fact you would look out of place if you weren’t wearing something Disney related. 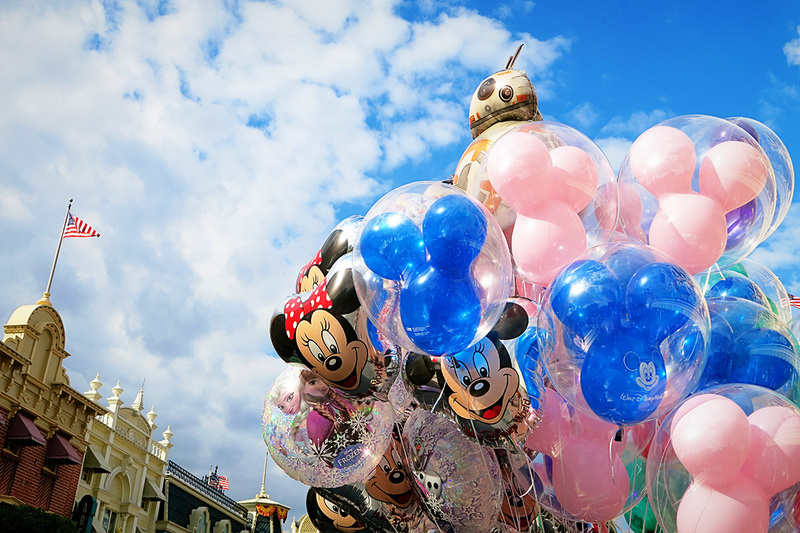 Main St in Magic Kingdom is so beautiful, full of old fashioned shops, people selling balloons, it’s full of colour and happiness every single way you look. We got a passer by to take a photo of us as the sun was setting and the castle was looking gorgeous in the background. 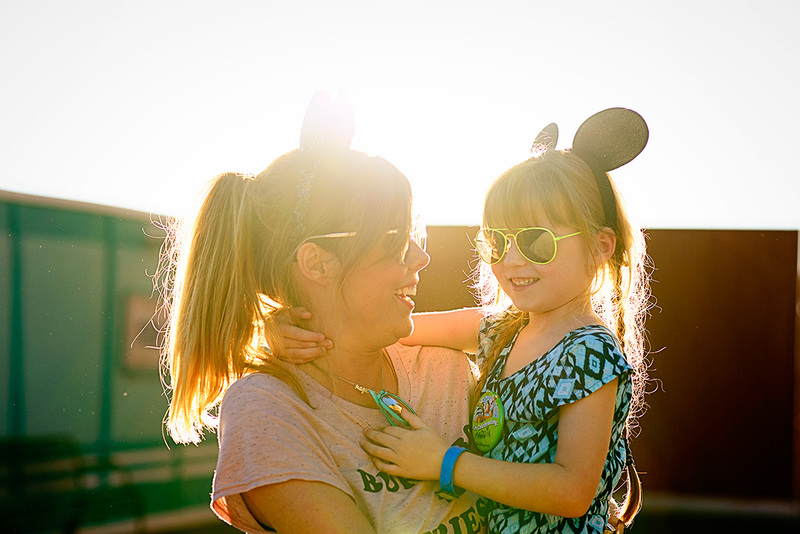 I had just been on Splash Mountain which is a big water ride with the girls and as a result my hair was a little wet, but I love it because we rarely have photos of just us together anymore. I absolutely love that he shares my passion for travel. On the Saturday of our trip we headed to Disney’s Hollywood Studios for the day. I have a whole post to dedicate to our day there, but this photo was one of my favourites we took. I love having adventures with this lot. This is probably my favourite photo of the whole entire trip. After a wonderful day at Hollywood Studios the sun was setting and we were walking past the lake there at just the right time. People often say what is the point in travelling with a baby, especially to somewhere like Orlando where they won’t remember it. But it’s about creating memories as a family and I will truly remember this moment forever. He was in his element during our time in Orlando. He slept better than he does at home, he thrived on the quality time with us and his sisters, he loved having people constantly stop to chat to him in his buggy and his smile was so wide the entire time. He just spent the whole time taking everything in and even now thinking of his little face so happy and animated makes me get tears in my eyes. This girl was also incredible company on holiday. Of course we had the odd tired meltdown from all of them, but I have mentioned recently that Mads has been going through a bit of a stage and I have been finding her quite hard work at times. However we seem to have turned a corner and she was such a good, polite, kind girl to be around, plus she has been since we came home too. I think she really thrived on having proper quality time with us all. These girls. They found the entire experience so magical. Our hotel, the Wyndham Grand Orland Resort Bonnet Creek had a fantastic pool with a lazy river and one afternoon we chilled out there. He loved splashing in the water and it was so much fun to see him enjoying himself so much. 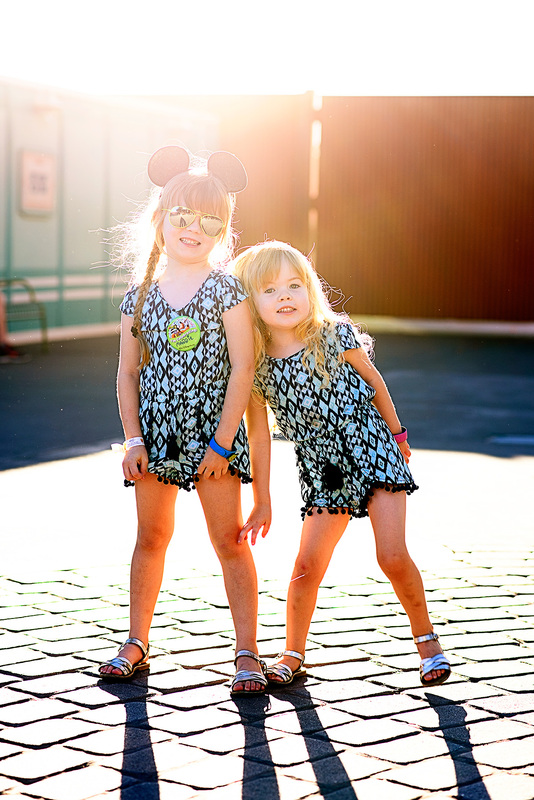 Another of my favourites of the entire trip, I absolutely love this photo of them in their Mickey and Minnie ears. These were kindly a present from the Visit Orlando team and it was such a lovely surprise finding such a thoughtful gift waiting for us in our hotel room when we arrived. 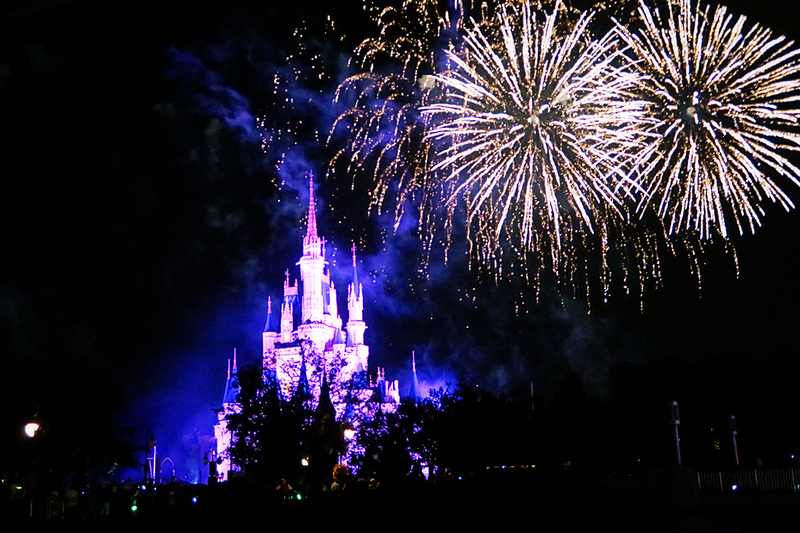 We stayed late at Magic Kingdom one night to watch the iconic Wishes firework display. We sat there and I remember remarking to Jon about just how relaxed and switched off I was, which to be honest is quite rare. It’s one of those moments that I know I will remember forever, just because I felt so happy. We took this photo and within minutes the girls had fallen asleep and practically missed the entire show! But still we enjoyed it. It is the most beautiful display and there were even grown men around me with tears in their eyes. One of the days we headed off to Winter Park, which I will again talk about in another post. We sat in a park for absolutely ages, just soaking in the sun and watching the world go by. It was the perfect antidote to the mayhem of the theme parks. We went down to the lake and sat there for ages, watching a man fishing. It’s honestly the most beautiful place, so peaceful and quiet. 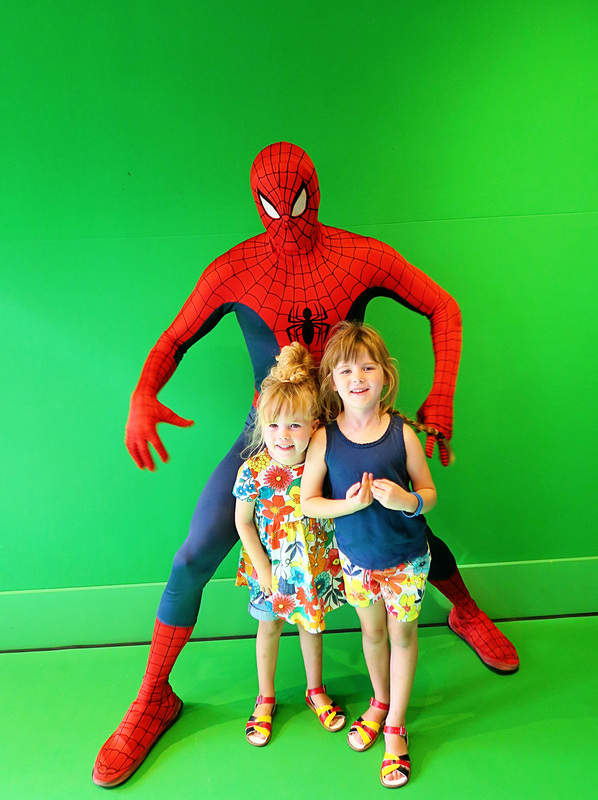 Back to the theme park action, I love this photo because the girls were literally in awe at meeting Spiderman at Universal Islands of Adventure. They were in awe of all the characters, mainly at Disney, but they were really funny when they met Spiderman as he is their current hero. They both went a little shy, especially Mads, and they looked a little embarrassed when he high fived them. It was so amazing watching their faces when they met them all. Again at Universal Studios, there is a large Harry Potter section. One really cool thing is that you can buy wands and then when you visit Diagon Alley you can use them at interactive points to ‘cast spells’. This was such a cool feature and Mads was in her absolute element at the magic of it all. 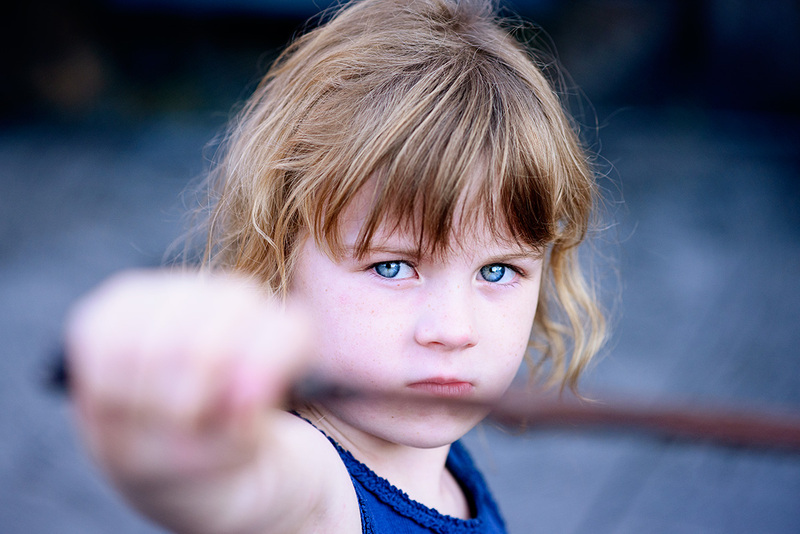 I love this photo of her casting a spell- look at the concentration on her face. 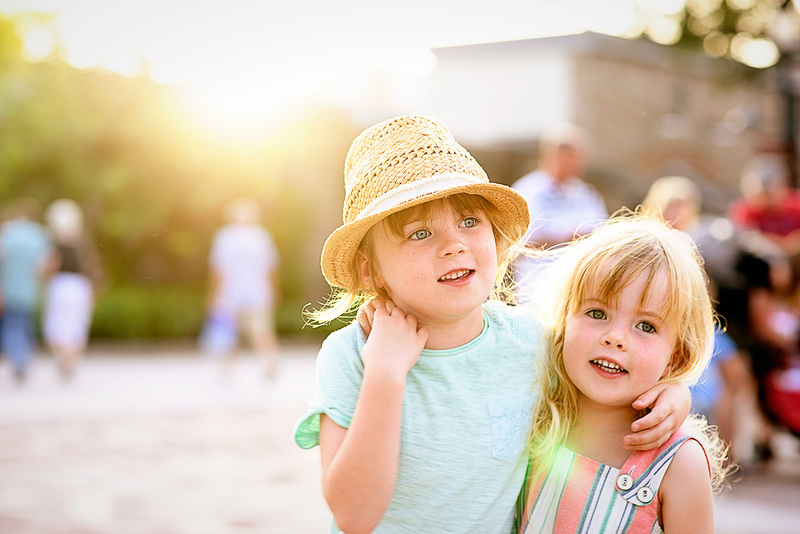 We went to Disney Springs one evening just as the sun was setting. 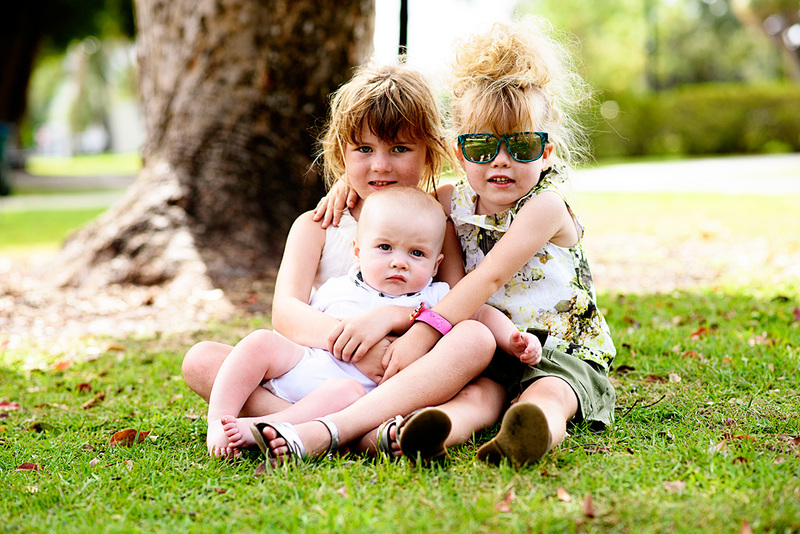 I took this photo of the three of them and I love it, mainly for the look on our baby boy’s face. He’s at that age where he idolises his big sisters. My girlies. They got on so well while we were there, of course we had the odd squabble but for the most part they had so much fun together. Golden light as the sun sets over Disney Springs. 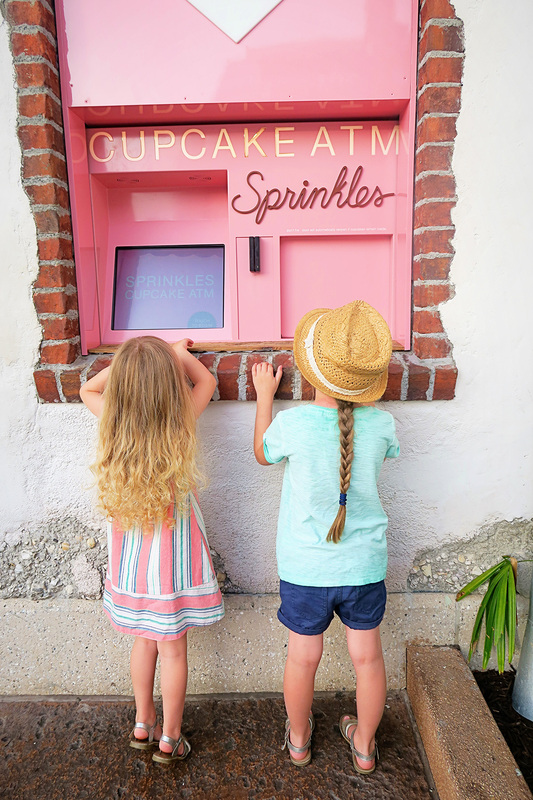 The girls absolutely loved the Sprinkles ATM at Disney Springs, which is basically just a machine that gives you cupcakes. They were so delicious and such a fun idea. One of the days we headed to iDrive 360, a really cool new entertainment complex which is where the new Orlando Eye is situated. 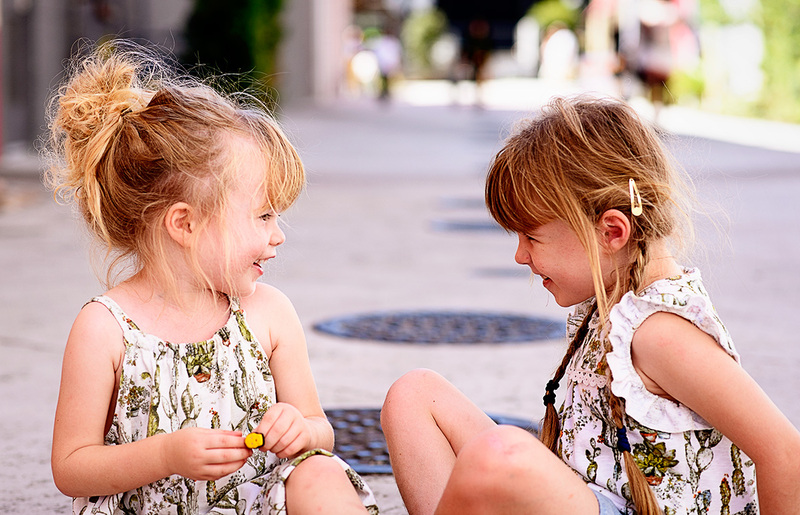 While we were waiting the girls were sat on the floor and I love these photos of them, they both look so grown up I think, especially LL. Before we left I bought the girls a bit Lotso bear as a treat and he was waiting for them in their car seats on the day we flew out to Orlando. 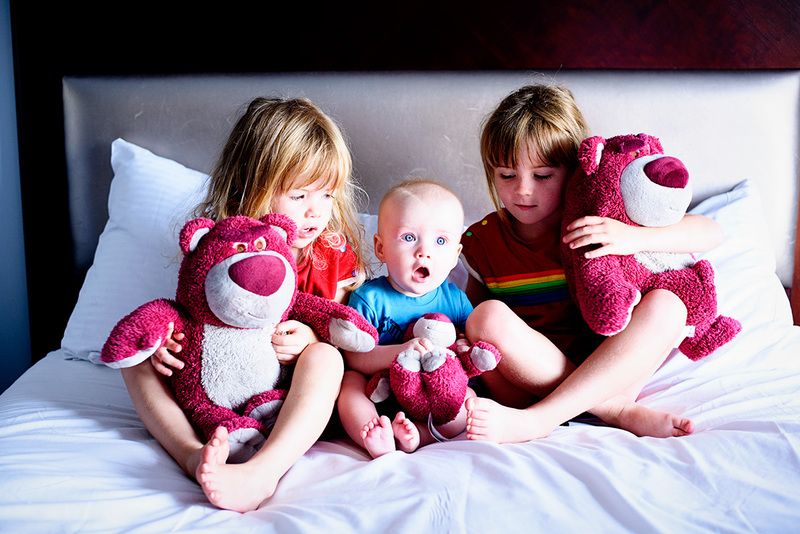 While we were there we found a small Lotso and we just had to buy it for our baby boy- this photo was a few minutes before we left our hotel room for the last time. On the plane due to come home. 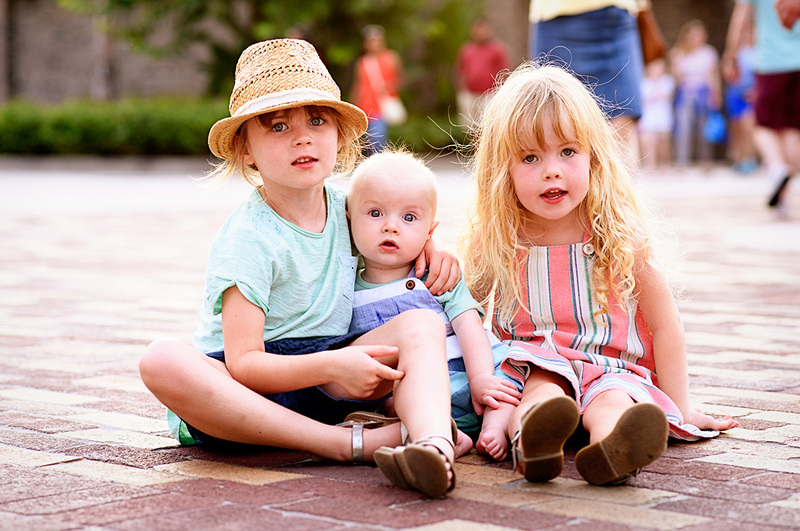 This photo makes me laugh as we were a little worried about the night flight home as while we were in Orlando airport the girls were a little wild and crazy, and we thought the flight was going to be an utter disaster. Jon’s face makes me smile. But actually it was fine and went well, they all fell asleep almost the entire way home! 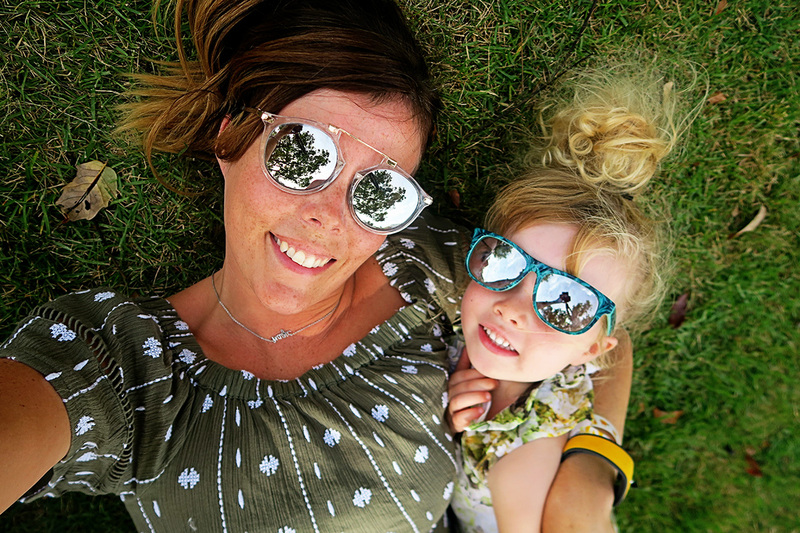 These are just some of my favourite photos of our holiday, but my blog is definitely going to be a sunshiny happy place for a while. Stay tuned for lots more Orlando posts. NB: Thanks to Visit Orlando for supporting our incredible trip to Orlando, we had the best time. All words, photos, videos and opinions are entirely my own. You can follow them over on twitter, instagram and Facebook. What an amazing collection of memories you must all have. The photos are amazing and I loved following your trip on instagram. This is somewhere I have always wanted to visit and plan to one day. Stunning as always Katie. So many amazing memories. Gorgeous photography and so many happy smiles. So glad you had the best time and were so well cared for from the visit orlando team. It looks like the best trip ever. So many amazing photos and I know just what you mean about worrying about flights. 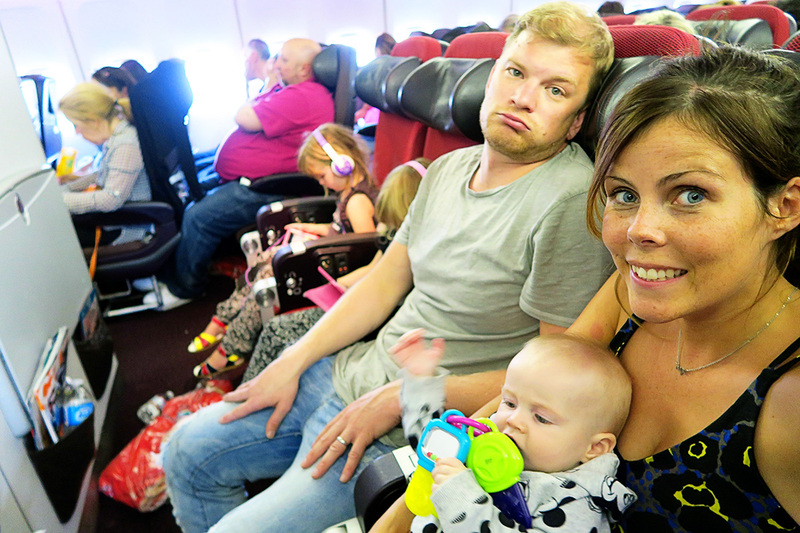 E has started his screechy phase and we had 7 hours to Abu Dhabi. He was so well behaved though (mostly 😄). That cupcake machine would be perfect in my house, I’m sure!! 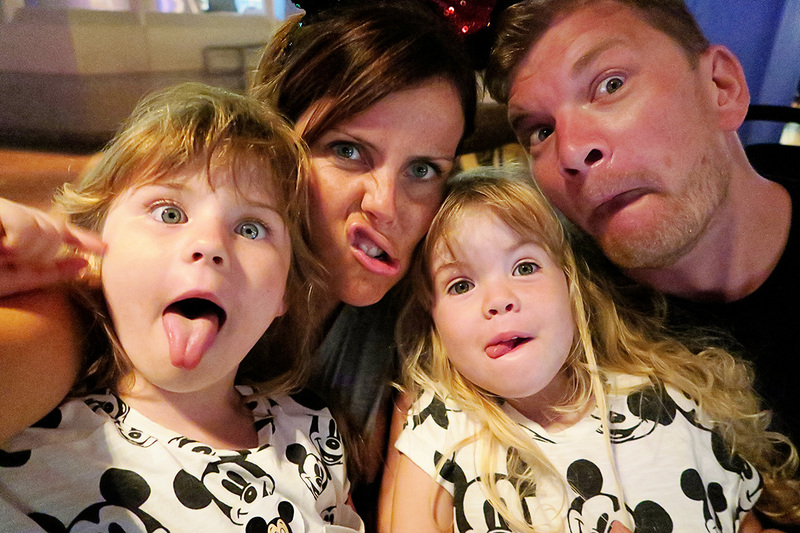 You make me want to go to Disneyworld! I can’t say it enough. Your pictures are breathtaking. The one towards the end with the girl makes me smile. I loved seeing your pictures on Instagram! You were all so clearly having an amazing time. I know what you mean about holidays shaping a family. I definitely feel as though we’ve grown up a little, all together, after some of our breaks.